Notre Dame started the fourth quarter at the Navy 3 yard line after starting at their own 30. Everett Golson was able to find the end zone on a three yard carry capping off a 10-play, 70-yard drive that took 4:14 off the clock. Notre Dame regained the lead, 35-31. Navy was unable to sustain their drive on their next possession. They key play was an incomplete pass from Navy fullback Noah Copeland to a wide open Keenan Reynolds. Reynolds was unable to catch a perfect pass and forced a Navy punt. Cody Riggs fumbled the Pablo Beltran punt but was able to recover on the Notre Dame 14. Golson found a wide open Chris Brown on their first play from scrimmage following the punt. Brown sprinted to the Navy 40 yard line where he was brought down by an apparent horse collar tackle. The penalty placed the ball at the Navy 25. On the next play, Tarean Folston ran up the middle to the end zone give Notre Dame a commanding 42-31 lead. Navy tried to convert another fourth down on their next drive. On fourth-and-three from the Navy 32, The Mids pitched to Noah Copeland who was unable to gain any yards turning the ball over to the Irish at the Navy 32. 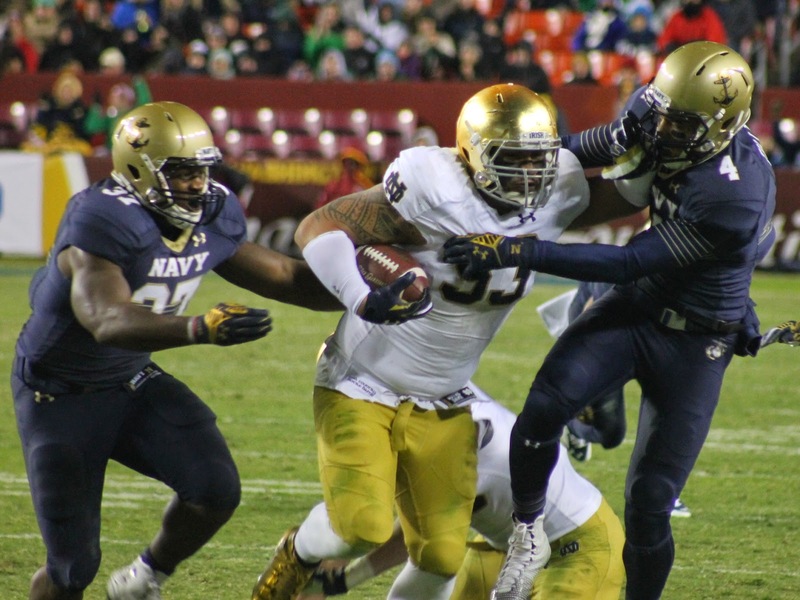 The Navy defense stood tall on the next Notre Dame possession, The Mids held the potent Irish offense to just three yards on three play. Notre Dame attempted a 46-yard field goal and missed wide left giving the ball back to Navy with 8:57 remaining in the game. 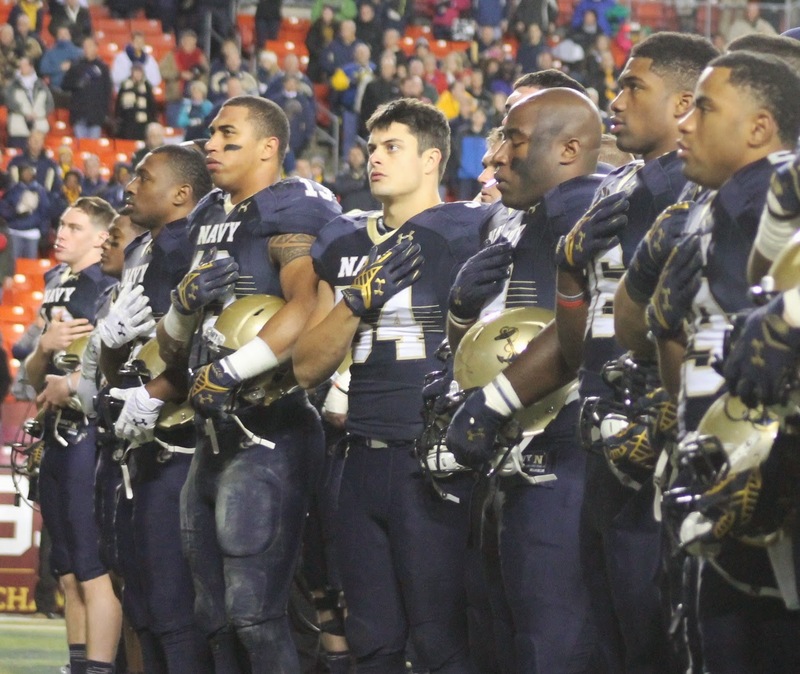 Keenan Reynolds' tipped pass was picked off by Justin Utupo to end Navy's next drive. The INT was returned to the Navy 30 yard line with 7:09 remaining in the game. On Notre Dame's drive, Navy nose guard Bernard Sarra blocked Kyle Brindza's 44-yard field goal attempt to give Navy the ball back with 5:43 remaining. Navy made things interesting on their next drive. Noah Copeland had a 33 yard carry followed by a 21 pass from Reynolds to Jamir Tillman to the Notre Dame 12 yard line. On the next play, Reynolds completed a pass to Chris Swain for a 12-yard TD. The catch was Tillman's first collegiate reception. Navy went for two and converted when Reynolds completed a pass to Geoffrey Whiteside. Notre Dame's lead was cut to 3, 42-39. 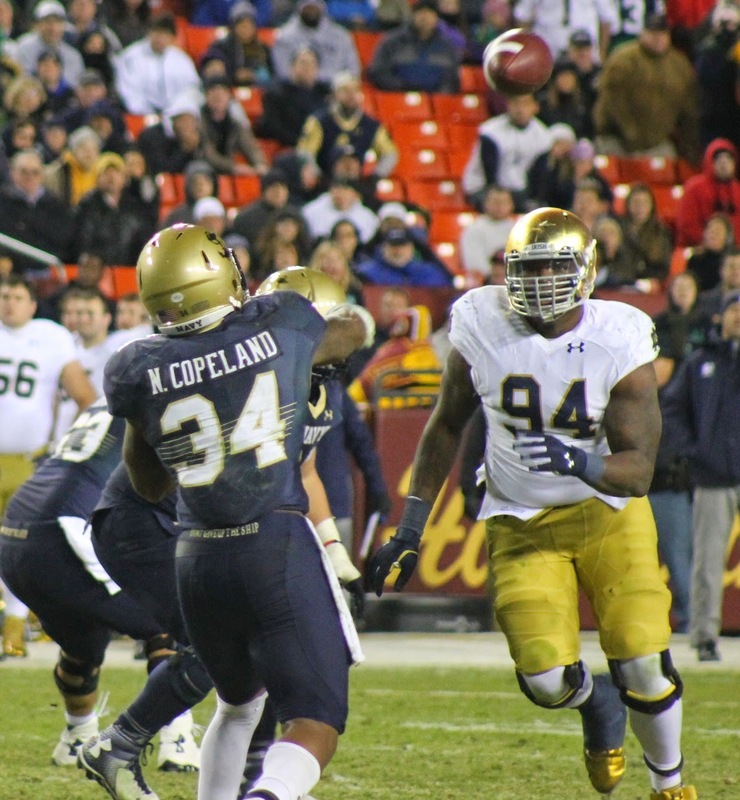 Notre Dame scored a TD on their next drive setting the final score, 49-39. 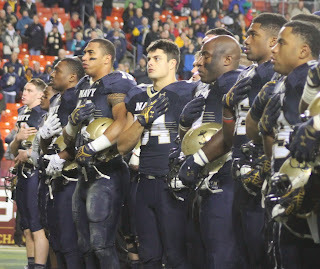 Navy players during the "Navy Blue and Gold"